So often it’s special events that make our patients prioritize their oral health and seek that perfect smile. It’s an extra honor to create smiles that give patients more confidence for their weddings or other precious moments. My patient was raised in Poland and this was where all of her existing dentistry had been completed. She wasn’t satisfied with her teeth and wanted to have a nice smile before her wedding. Her smile needed to be vibrant while addressing her discoloration, wear, and rotation. 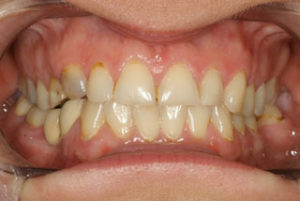 We treatment planned teeth #3-13. 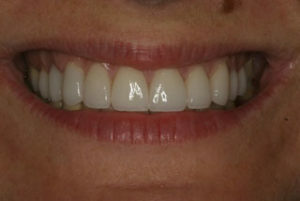 Then, we utilized a wax-up for patient communication and, most importantly, functional, beautiful provisionals. As part of my aesthetic experience, I insist that my patients wear their temporaries to test the subjective appearance, toleration of length and shade. 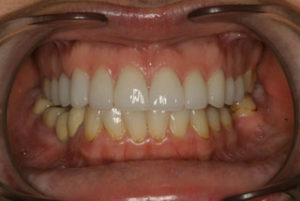 Two weeks after her preparation we finalized the design before prescribing permanent restorations. The Gold Dust aesthetic team did an amazing job fabricating these restorations out of IPS Empress. My patient is thrilled with her smile. She sent wedding photos and a thank you letter to me and my team. She says she used to dread having her picture taken. For the first time, she had so much fun in front of the camera on her big day. Did you read the last Case of the Month? Check out the rest of this series for firsthand accounts of successful dental cases from our incredible community of dentists here!